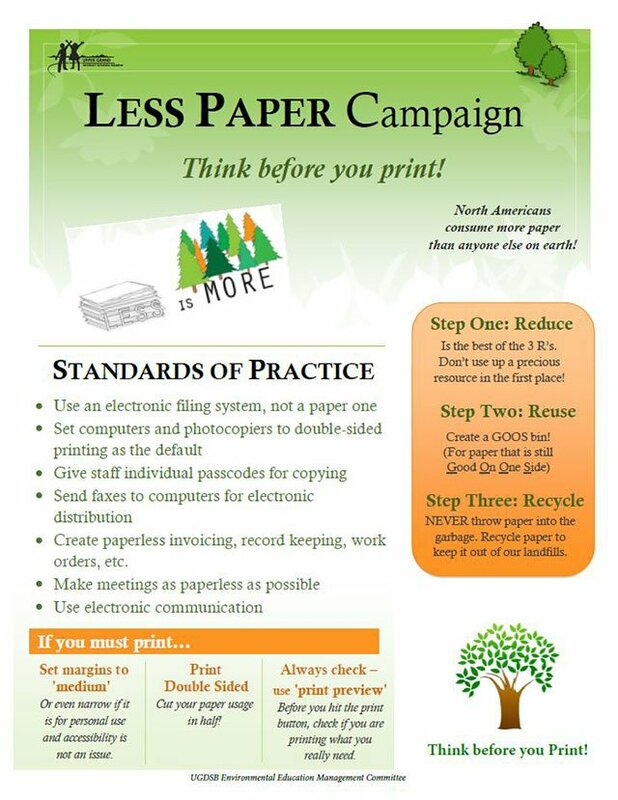 In the 2014-2015 school year, the UGDSB launched a Less Paper Campaign to reduce our paper consumption. North Americans consume more paper per capita than almost anyone else on earth. We need to change our habits and conserve our forests, as they are the lungs of our planet and the protectors of enormous biodiversity. Some reports show that paper production is the third most energy-intensive of all manufacturing industries, and is also the fourth largest emitter of greenhouse gases. Every ton of recycled paper saves about 17 trees. We need to do our part to make a difference and demonstrate environmental stewardship and slow down climate change. Every school and both board offices are looking at their current paper consumption habits and are encouraged to set a paper reduction target. We are all committed to finding new ways to change our practice in order to reduce our dependence on paper. What should we do to reduce our paper consumption? Think before you print! Do you really need a paper copy of that? Support the move to paperless pay receipts, invoicing, record keeping, banking, etc. If you must print: Always print on both sides of the paper, and set document margins to ‘narrow’ to create fewer pages. Use the ‘print preview’ button to double check you are only printing what you need. Ask companies to stop sending you junk mail and catalogues. Use a reusable travel mug instead of paper cups. Some coffee places give you a discount if you use your refillable mug! Avoid using paper plates and cups at family gatherings or meetings at work. Buy products with the least amount of paper packaging. Support businesses that follow environment friendly practices. Buy recycled paper materials or products that came from sustainably managed forests. Schools are encouraged to use the helpful resources available on UGshare to launch the Less Paper Campaign and inspire staff and students and the entire school community to make a difference. View the Less Paper Campaign Poster and PowerPoint Presentation.